getcalc.com's Fraction Calculator is an online basic math function tool to perform addition, subtraction, multiplication, division and average between two or more fractions, whole numbers and/or mixed numbers. Users are not required to convert the equivalent fraction for mixed numbers, instead the mixed numbers can be directly used in this calculator. Users are recommended to supply the mixed numbers in the format of A(B/C). For example, a mixed number 2 1/2 should be provided as 2(1/2). In addition users may find solved examples for arithmetic operations between two or fractional, mixed or whole numbers which may helpful to understand how to do it yourself or to solve similar worksheet or practice problems. what is 3/4 plus 3/4? what is 2/5 divided by 2? what is 5/8 plus 1/4? what is 1/6 minus 1/7? what is 2/3 x 1/6? what is 1/7 divided by 7? difference between 5/8 & 2/5? Fractions Arithmetic is a basic mathematic function represents the basic operations of addition, subtraction, multiplication & division between two or more fraction, mixed or whole numbers. Any whole numbers can represented as a fraction. For example, the numeric value 5 can be written as 5/1. 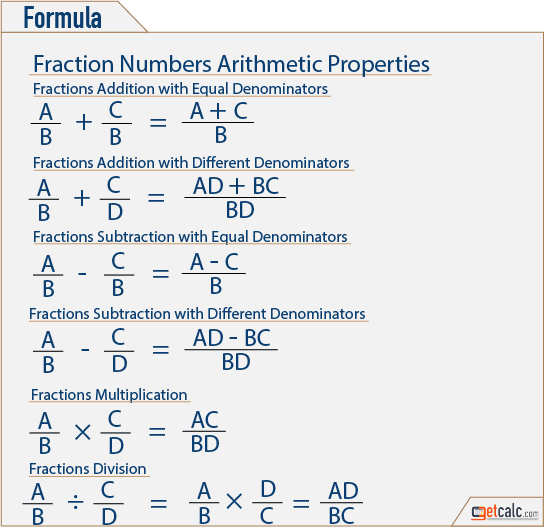 Use the below formulas to perform different arithmetic operations between the fractions & mixed numbers manually. Users may also use this fraction calculator to verify the results of such calculations online.